Director Rian Johnson movies have a distinct visual and emotional style. Which is a pretty impressive feat given how young a filmmaker he is. Most directors take a few films before they solidify their style. Here’s how you can learn to create a shot list like acclaimed director Rian Johnson — just remember that for the Last Jedi, the star wipes were someone else’s idea first! Rian Johnson movies have a classical, throwback sensibility to them. As you can sit down with films like Brick and tell immediately that it’s a Rian Johnson movie. They’re as equally comfortable being kinetic as they are sitting still. Not afraid to move the camera in interesting ways, yet not afraid to just sit with a scene. One of the Looper director’s greatest tricks is his ability to take his time. By starting the scene just a little bit earlier than he traditionally needs to, he can accomplish two goals. First, there’s an old Hollywood feel behind Rian Johnson’s movies. The Brothers Bloom feels like an old-school screwball comedy (albeit a dark and sometimes violent one). Looper and Brick are both incredibly noir. Even Star Wars: The Last Jedi falls under this heading, despite not really being a “Rian Johnson movie” in a sense. Aside from being part of one of the classic movie franchises, Star Wars movies are intentional callbacks to the old Flash Gordon serials of the 1930’s. They’re Hollywood classics that call back to older classics. The second thing it allows him to do is play with tension. He can surprise us, or he can subvert our surprise. One of the best examples of this is from Brick. ​We spend almost five seconds watching Tug walk towards Brendan before decking him. What’s most amazing about this is that Brendan spends those same five seconds watching Tug with us. With that much time, we expect some kind of surprise. Maybe Brendan will hit first. Maybe he’ll dodge and Tug will break his hand on the car. But no, he just takes the hit. Johnson gives us that time to just sit in anticipation. To worry as this incredibly menacing psychopath storms down on Brendan. It makes that kinetic punch feel all the more awful. 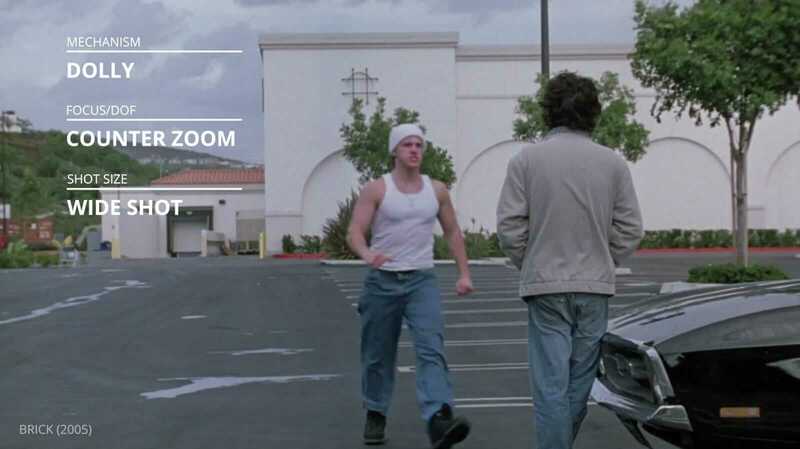 Another tip to old-school filmmaking in Rian Johnson movies is his love ofbig, expansive wide shots. They almost border on voyeuristic. He especially loves these for execution-style scenes in his neo-noirs. Take a look at this one from Looper. ​This is the moment where Young Joe is supposed to kill his future self (Old Joe). It’s him closing his loop and ending his own life. Long story, it involves time travel. This is an incredibly intimate moment. A form of suicide – Joe has known this moment was coming ever since he signed up for his job. The price he pays for the high life he lives. And yet look how small they both are against the background and the sky. We aren’t a part of this action, we’re watching it from afar. This isn’t something we’re typically supposed to see in a film. It’s not glamorous, it’s not cool. It’s brutal and awkward and strange. And by putting in a wide shot, it only heightens the uncomfortable brutality of it. Since we’re writing about Rian Johnsons’s directing style, we figured let’s show it with a shot list and storyboard from one of his scenes in Looper. Use it as inspiration when creating your own shot list! 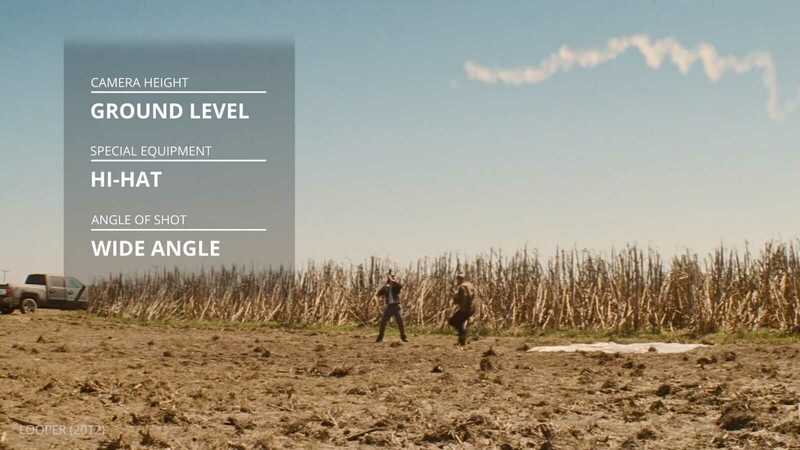 This storyboard of Looper was created in StudioBinder. Like any good writer of noir and con stories, Rian Johnson loves a good reveal. If you haven’t seen the end of the Brothers Bloom, prepare to have your mind blown and your heart ripped out. His stories tend to be layered and complex, and you never truly understand what’s going on until the final frame. And he loves to unveil those secrets with the panning reveal. A favorite of Tarantino’s directing style as well as Scorsese, it’s an old technique that helps feed into Johnson’s preference for long takes. The panning reveal allows Johnson to essentially fold two cuts, two pieces of information, into one shot. It may not be a Rian Johnson movie per se, but you can see the same directing style at play in this scene from the Breaking Bad episode “Ozymandias”. Yes, director Rian Johnson fielded a few Breaking Bad episodes. ​Every episode of Breaking Bad is, at its core, about the dichotomy at the heart of Walter White. The genial chemistry teacher he appears to be, and the ruthless criminal he truly is. Panning from Walter to a bullet hole in his car that piercing through his reflection is almost the entire show in one, elegant shot. The man he appears to be and the ultimate fate that may be awaiting him. We’ve talked a lot about how Rian Johnson movies have an old Hollywood sensibility to them. It’s one of the things that makes him such a perfect director fit for The Last Jedi. However, that isn’t to say that he’s somehow been transported here from the 1940’s, like one of his Looper characters. The Looper director grew up in a more modern tradition, a tradition that isn’t afraid to move the camera or fill the frame with a kinetic rush of action. He especially loves to use it to emphasize power or a lack of control. And it seems like yesterday that Rian Johnson directed the Brothers Bloom. ​This shot was heavily featured in the run-up to the release of the film, and it’s not hard to see why. It’s a uniquely Rian Johnson visual, impressive for a film series with such a firm, established visual style. In the original Empire Strikes Back, Yoda had Luke practice lifting small stacks of rocks before challenging him with lifting his X-Wing fighter out of the muck. Here, we see Ray touch the ground and dozens of tiny shards of rock levitate around her. It’s one of the best visual examples of the Force as an energy field that surrounds us. It doesn’t even look like Rey is trying to levitate anything. It’s just sort of happening. Such is the incredible power of the Force. Rian Johnson is a unique director. Able to combine a kind of old Hollywood sensibility with modern techniques, he burst out of the gate with a distinct style. So distinct that fans have even identified the trailers to The Last Jedi as being “uniquely Rian Johnson”. He’s a filmmaker who loves to play with narrative. Who clearly knows the rules laid down by directors before him, but loves to break them at will. Want to start building your own shot lists? Sign up for StudioBinder and start building your own project for free. And if you want to learn more, check out our Mastering the Shot List video series!